From the humble days of Galileo’s water pressure thermoscope, to the tried-and-true mercury thermometer that we all tried to use to get out of school with a fake sickness, to modern electronic temperature sensors, humanity has proven time and time again that we really care about the temperature of our environments. In this article, we will explore the current landscape of heat sensors, and follow in the tradition of Sean Paul in keeping our rooms at just the right temperature. Let’s first dive into a simple overview of what heat is, what the difference is between heat and temperature, and how that’s relevant to our discussion here! Temperature is, basically, the total level of motion (or, if you want to get technical, of kinetic energy) of the particles in the air. When particles gain energy, they start vibrating and moving around a lot, and those particles banging into each other and the walls of their container generate what we call “heat.” As a side note here:- space heaters work by adding high energy particles to the air, and radiators work by adding energy to the particles around them to increase the overall total movement of particles in the air! Now that we’ve established that heat is the motion of particles, we can think about what happens at phase transitions — for instance, when ice melts into water (solid to liquid), or when water boils into gas (liquid to gas). It’s common knowledge that these processes occur at certain specific temperatures when you go from under the threshold (32 degrees for ice, 212 degrees for water) to just over the threshold. But why does the process happen? This is where we have to go back to our definition of temperature. As the temperature is increased, the particles (atoms) in the ice or water vibrate more, and eventually they reach a level of vibration where they break the molecular bonds that tie them together, and in the case of solid to liquid, they can flow freely around the substance, and in the case of liquid to gas, they break free completely and start floating around the air. Why is temperature important for IT rooms? In modern companies, the IT room is often the most sensitive and delicate room in the office. Concretely, it is the most valuable room, as it is where all the high-value data is stored. Without the right security, It’s also particularly vulnerable to interference, seeing as, if all is rolling smoothly, no human intervention is needed and it is usually unoccupied.. Unfortunately, it’s also one of the most damage-prone rooms, as it’s full of delicate machinery that can easily malfunction and cause trouble, on a small or large scale. 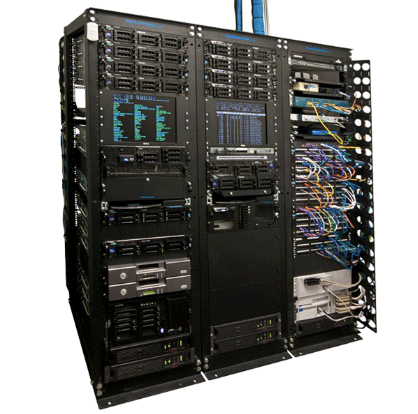 Servers are, essentially, big bunches of circuitry and wires and delicate metal parts, encased in some form of plastic. Looking back at our definition of heat, it’s easy to see how these might be a recipe for overheating and melting and, more importantly, fires and catastrophic failures. When a server is working normally, the hard drives spin, electricity runs through the wires, and the overall energy of the system increases, meaning that the particles of each component move around a lot more. And while the melting point of copper (the main metal in PCBs) is quite high, the melting point of plastic is much lower, making the heat buildup a recipe for a meltdown. In a box full of sensitive, electrical parts, smoke and its more dangerous counterpart, fire, are always a primary concern. It goes without saying that fires and servers generally don’t see eye to eye, so in order to prevent these sorts of mishaps, you should install some (or several) temperature sensors and checks in your IT room. How can you best monitor your IT room temperature? 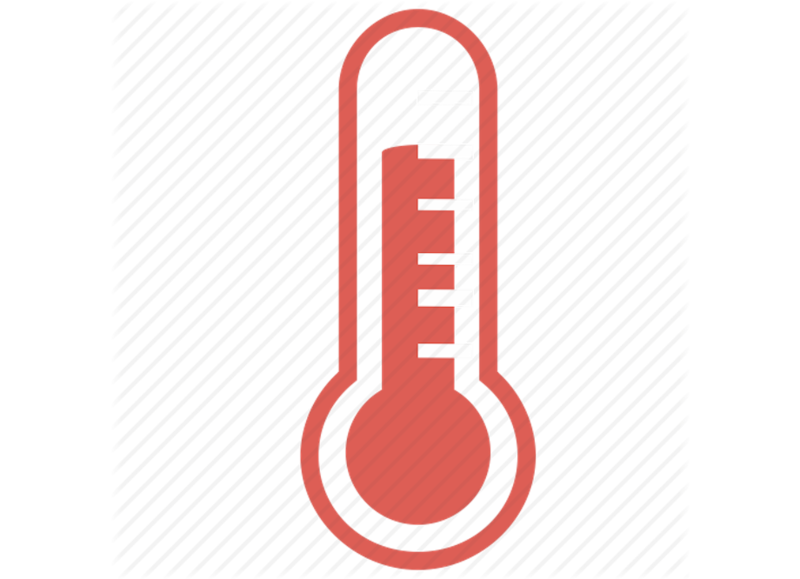 Monitoring the temperature of your IT room is crucial to its proper operation. Let’s take a look at the practical temperature sensors out there that you can install in your IT room. Most temperature sensors and thermometers that spring to mind when are non-contact temperature sensors. Any sensor mounted on the wall, or mounted on the ceiling, or generally just monitoring the temperature of the air, can be categorized as a non-contact sensor. Non-contact sensors generally use either convection or radiation to measure changes in temperature of their environment. Basically, they measure the speed of the airborne particles/atoms that approach them, and given that the speed of particles is directly related to their energy and their heat, the sensors use math to translate this to an ambient temperature. 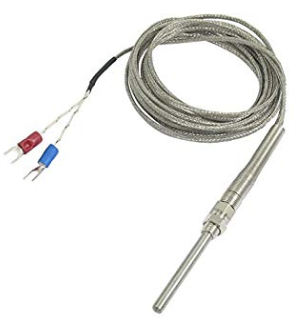 By far the most common commercially available temperature sensor, thermocouples are cheap, easily fixable and interchangeable, compatible with almost any variety of connector our there, and can measure a wide range of temperature. They also require no power to operate, as they are comprised of just two plates of metal that separate or connect based on the ambient energy. Their main drawback, though, is precision — generally their confidence interval of measured temperature is over one degree fahrenheit. As you can see from the picture below, the temperature sensing part is encased in a metal tube, but this can also be encased in ceramic or other materials, depending on whether you care if it’s conducting or not. A thermistor, or thermally resistant sensor, measures temperature by converting ambient energy into changes in resistance. It’s made of semiconducting materials, and its key feature is that its resistance doesn’t increase linearly with temperature: it increases slowly at first, then sort of all at once when a threshold (different for each one) is reached. Its primary application is for when you have a specific temperature above which you don’t want the room to go. 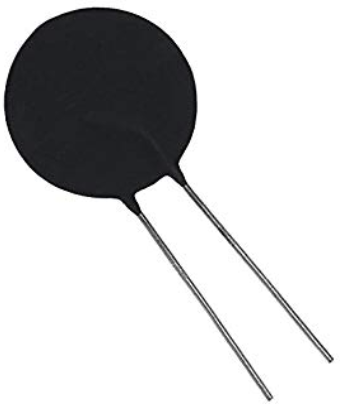 Thermistors are great at letting you know quickly and accurately when you go over the limit, but are a bit useless when the room temperature is below the limit. A circuit breaker is probably the simplest type of temperature sensor. It doesn’t tell the temperature, doesn’t have a dial, doesn’t need power or any human intervention: it’s just a metal wire with a slightly lower melting point than the circuit that it is monitoring. If the total energy in the circuit increases too much, for instance, by overuse or a surge, then the breaker will cut out before any damage to the circuit itself can happen. Simplicity is nice sometimes. Similarly to the thermistor, an RTD measures changes in temperature by changes in its own resistance. However, the difference here is that RTDs require a current to run through them, meaning they need to be powered. They can easily be used as a contact temperature sensor: simply attach it to the circuitry that you are attempting to measure. The changes in electricity will cause changes in the resistance of the RTD, and register as changes in temperature. Semiconductor-based sensors can also be placed directly on circuit boards. Effectively, they are two receivers (diodes) with temperature-sensitive characteristics between them. They will measure differences in voltage vs. current, and translate that to changes in temperature to notice if/when a circuit is overheating. However, circuit breaker and surge protectors won’t ensure the safety of the other delicate components on the circuit boards, or for the plastic server enclosures themselves. That’s why we recommend the installation of a different type of temperature sensor, as well as a fire detector in the room. If you’re already set on contact sensors, you should have a non-contact ambient temperature sensor installed within reasonable distance of the overheating components (i.e. the servers). A fair sprinkling of thermistors and thermocouples around the servers is a good way to start, but you might want to look into more modern smart sensors with built-in connectivity measure, which we cover in the next section! Now that we’ve covered the basic science of the main categories of temperature sensors, and their various applications, we can move on to slightly more sophisticated categories of sensors: smart sensors, like the ecobee room sensor. These temperature sensors generally fall into the non-contact type, as they will be installed at various unobtrusive spots throughout the home or office. They measure the ambient temperature, and thanks to their integrations with smart home hubs like Google Home or Amazon Alexa, they can communicate with your other appliances. Crucially, this also means that they can prompt actions without needing human intervention: if a sensor reads a dangerously low temperature, it can prompt the heating, or conversely if it reads a dangerously or unusually high temperature, it can turn on the air conditioning, or notify a human. In the same vein as the connectivity point, modern smart sensors can perform data analysis and tracking, and give useful insights about your energy use. For instance, a smart sensor can be programmed to lower the temperature automatically at certain hours of the day, to save on energy bills, or even, if it’s connected to motion sensors, to increase/decrease the temperature based on whether or not there are people in the room. In terms of tracking, these systems can also record your data over a period of time, and transmit that back to you in clean and organized ways, so you can better understand if and when you’re wasting energy. 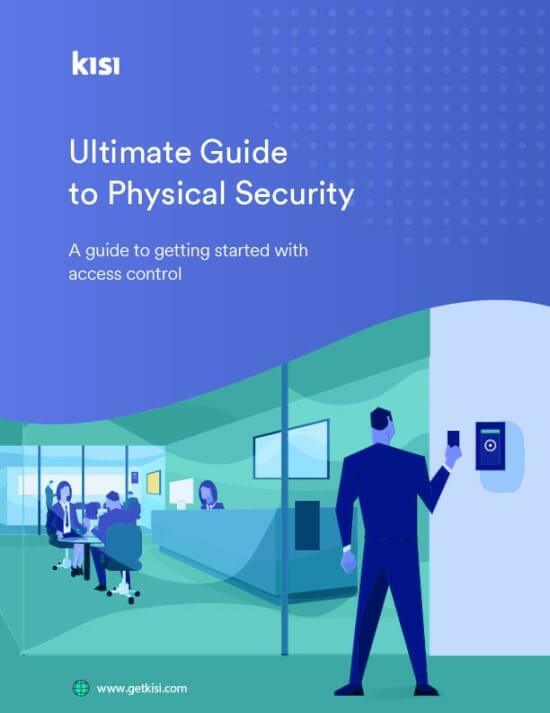 In the same spirit of connectivity, having all your security solutions in one platform, and namely having access to both temperature sensors and access control from a mobile platform can be crucial. If you opt for a self-monitored system, or for some reason the monitoring malfunctions, and you are off-site as the admin of the location, you will still want an immediate response to any incidents that may occur in your IT room. With a mobile-based solution like Kisi’s you can receive a notification from the sensors, and quickly grant remote access to somebody on-site to do some emergency damage control. Mobile systems are truly the future! Temperature sensors are an integral part of any IT room or general facility. They can help protect sensitive areas and data, and with smart innovations can help you better track your use, and can guide you towards a more sustainable lifestyle. Kisi strongly recommends making full use of these technologies to help secure your space!